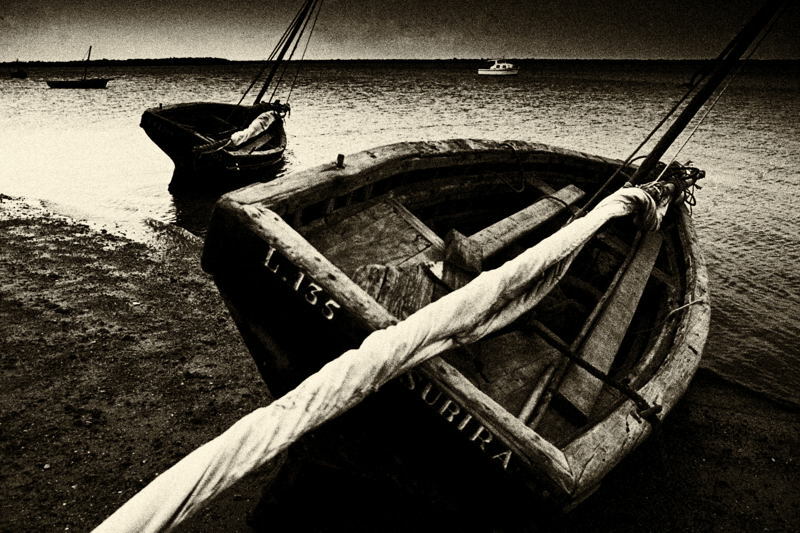 Boats on the beach at Lamu, on the coast of Kenya; July 1978. This photo has been digitally manipulated (in Silver Efex Pro) to produce a dark, brooding look. The dimly seen white motor boat out on the sea balances the picture – obscure it with your thumb to see what I mean. I also like the repeating patterns of the two boats nearest the camera, which have similar shapes and which are inclined at the same angle. Technique: Olympus OM-1 with 28mm Zuiko lens; Agfa CT18 colour slide rated at 64 ISO; Silver Efex Pro. Mooring line on board the Thekla: there is another image of this ship’s hawsers, and some context, here. Technique: X-T2 with 55-200 Fujinon lens at 305mm (equiv); 1600 ISO; Lightroom; East Mud Dock, Bristol; 12 May 2017. Mooring line of the Thekla, a ship housing a live music and night club venue, which lives in Bristol’s East Mud Dock. 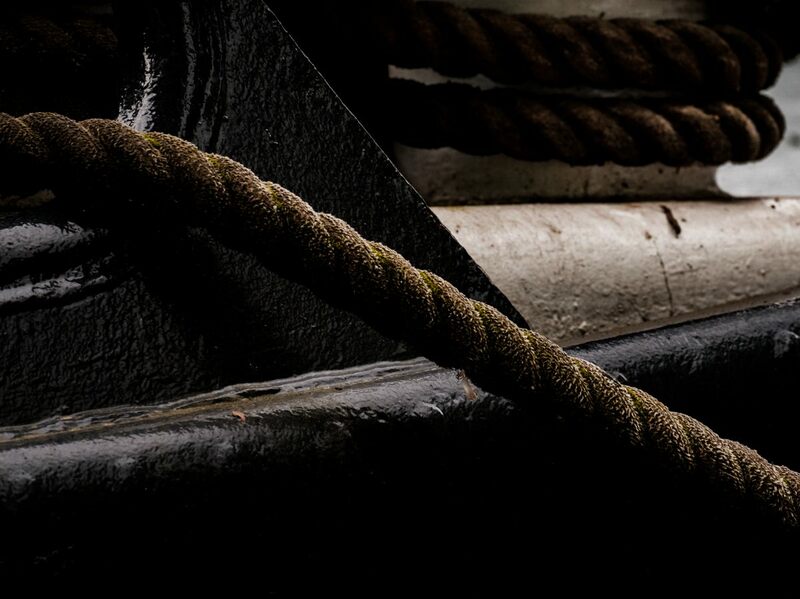 Composition: the rugged, solid, eminently workmanlike personality of a ship – tough, massive ropes attached to strong, thickly painted ironwork – even though this particular ship nestles eternally at the quayside in Bristol’s sheltered harbour. Two things strike me here. First, there is this great, thick rope cutting diagonally across the frame, with another view of it, just catching the light and wound around very stout ironwork, at upper right. 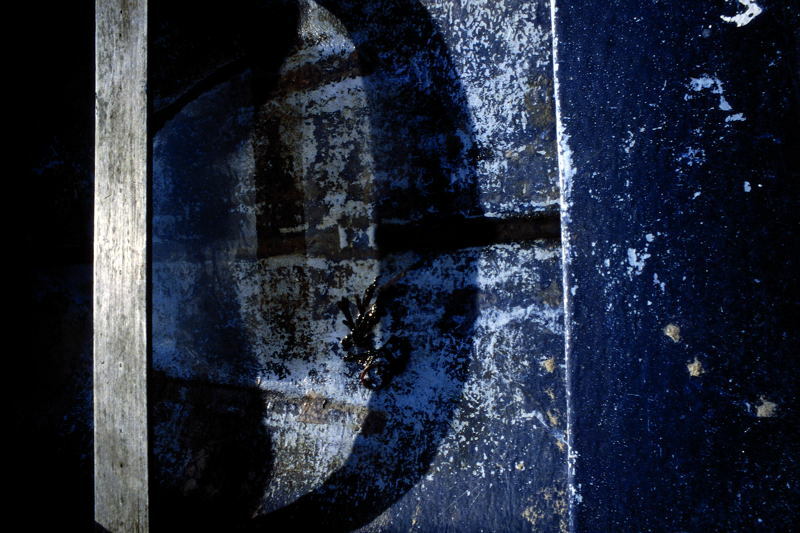 And then there are two strong and opposing linear features – the diagonal hawser already alluded to, and the sharp, upper edge of the dark metal behind it, which descends at a similar angle and almost seems to cut into the rope – both of these being almost at right angles to the very strong lineations of the cream and black ironwork which cut through the image from lower left to centre right. Technique: X-T2 with 55-200 Fujinon lens at 305mm (equiv); 1600 ISO; Lightroom, including the Classic Chrome film simulation; 12 May 2017. 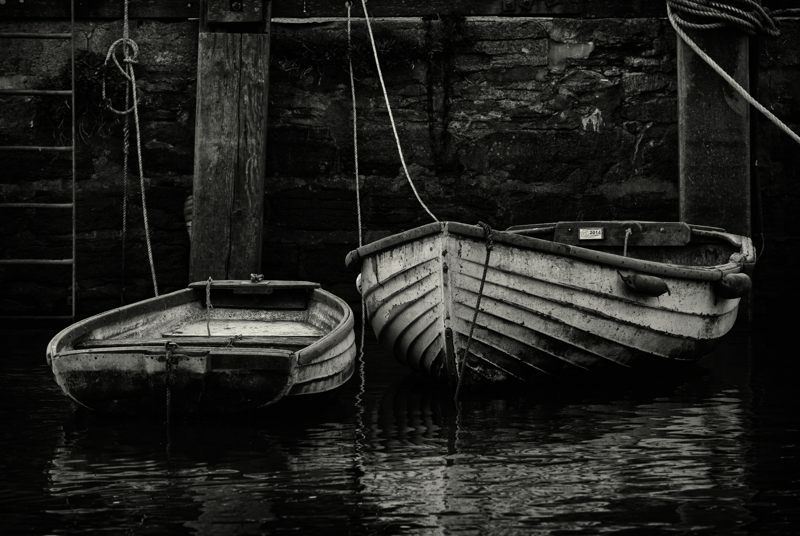 The prow of a small boat in Mevagissey harbour, Cornwall, on a still morning; 24 Oct 2012. I think this must be the most perfect reflection photo I’ve ever taken. Conditions were ideal – an overcast morning with barely a whiff of breeze. 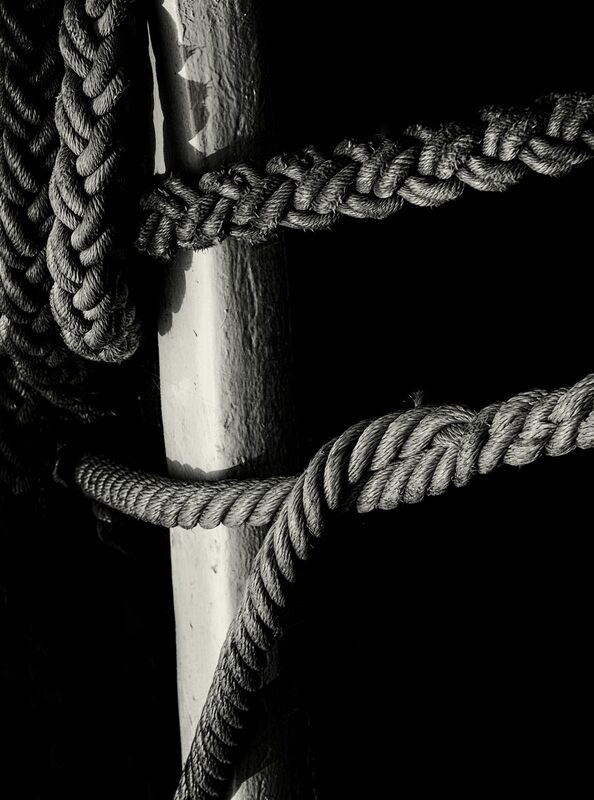 This boat was moored at the quay, and the rusting chain is its mooring line. D700 with 70-300 Nikkor at 240mm; 5000 ISO. I rarely get enthusiastic about boats, I can’t even swim, but as soon as I caught sight of the Sharon Tracey in the little harbour at Porthleven, it was love at first sight! I mean, what a dinky (in the British sense of the word) little boat, decked out in blue and yellow, lounging around slightly askew at low water, her little boarding ladder on the left, and one of her tiny propellers visible on the right. Here is almost toy-like beauty. 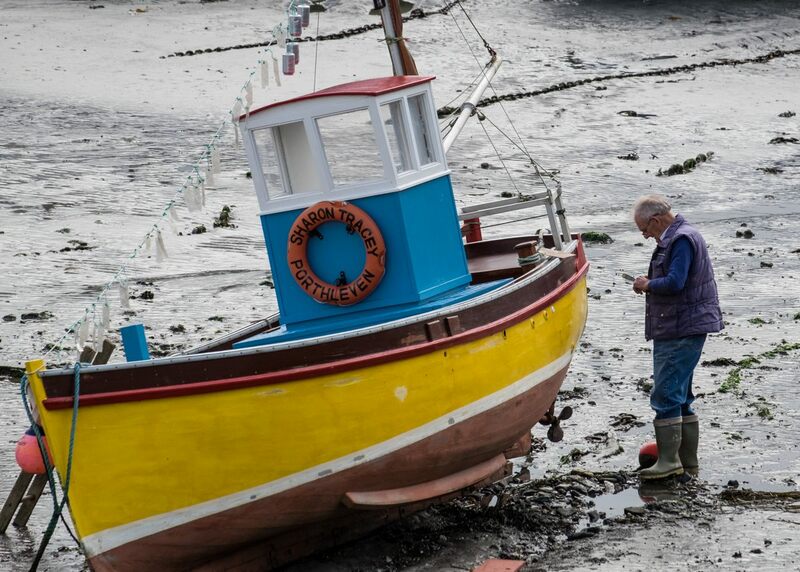 But this is flagged as a post about people and, although Sharon may well have a personality of her own, this photo – to me, anyway – is about the man, whom I’m presuming is the boat’s owner. Here is someone who must be into boats, seriously into boats, and how happy and proud he must be to skipper this little floating gem. We Brits have a phrase – messing about in boats – and here’s someone, in jeans, Wellington boots and body warmer, who does it a lot – and doubtless enjoys it a lot too. I would guess that he’s a fisherman of one sort or another, maybe he has some crab or lobster pots a little way offshore, something like that, or maybe he actually fishes. What a life, far away from urban sprawl, commuting and rush hour traffic. I don’t know him at all, but I would imagine that he loves being in this little boat, that he has some good quality of life, and that he’s happy in what he does – as modern idiom would put it, “WAY TO GO, MAN, WAY TO GO!!!”. Click onto the image to see a (much!) larger version in a separate window. X-T1 with 55-200 Fujinon lens at 300mm (equiv); 800 ISO; Porthleven harbour, Cornwall; 18 Oct 2016. Safety ropes on the gangplank of a floating restaurant; Bristol Bridge, central Bristol; 16 Sept 2016. 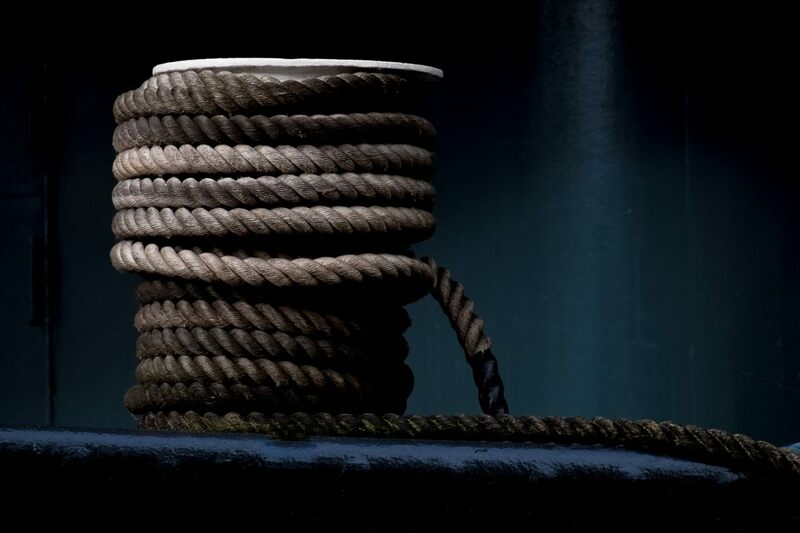 These undulating ropes, set against the shadow of the ship’s side, were eye-catching. 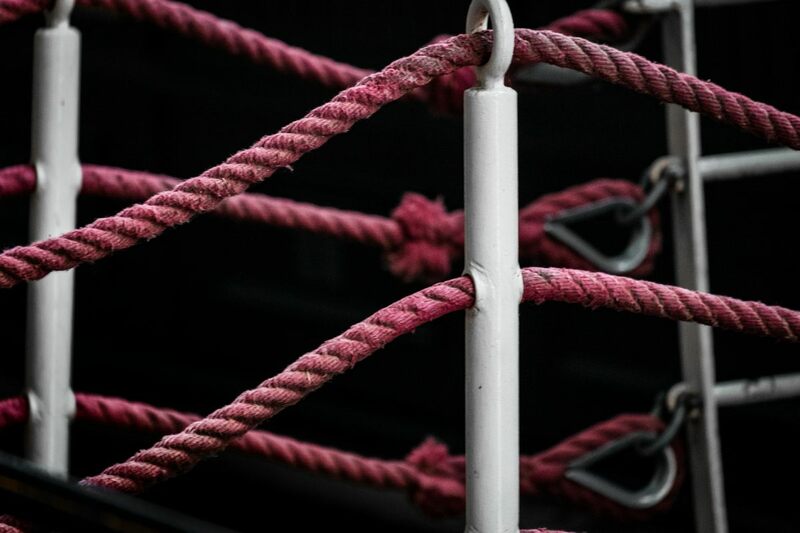 I tried taking the image into black and white and then restoring the ropes’ colours, but actually a straight colour version does rather better. X-T1 with 55-200 Fujinon lens at 305mm (equiv); 6400 ISO. 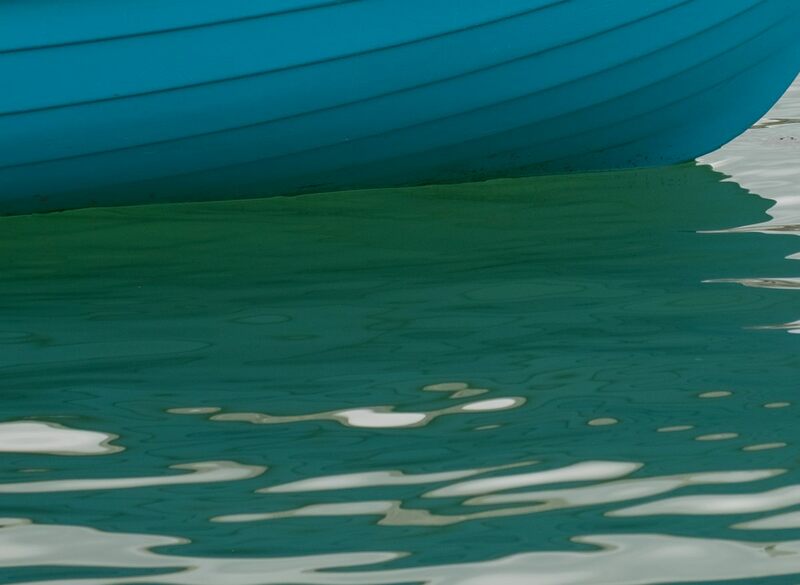 A small, blue boat rides at anchor – a very simple image, that’s really all there is to see. 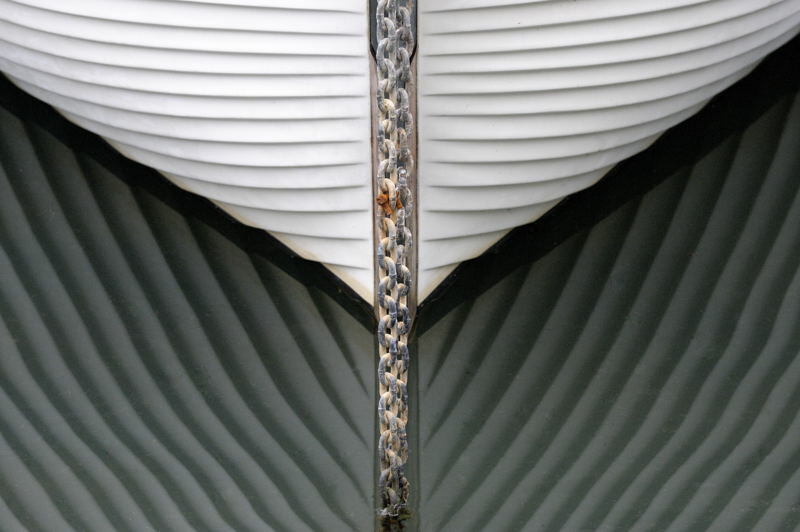 The only solid facts are the simple, elegantly curving lines of the boat. Beyond them, the sea’s surface takes on a silvery hue where the light catches it. But in the craft’s brief shadow, this paleness disintegrates and fragments as, approaching closer to the graceful blues of that wooden hull, the emerald greens of the sea deepen and, gently but firmly, draw us further in and deeper down. X-T1 with 55-200 Fujinon lens at 305mm (equiv); 400 ISO; St Ives, Cornwall; 21 Sept 2016.